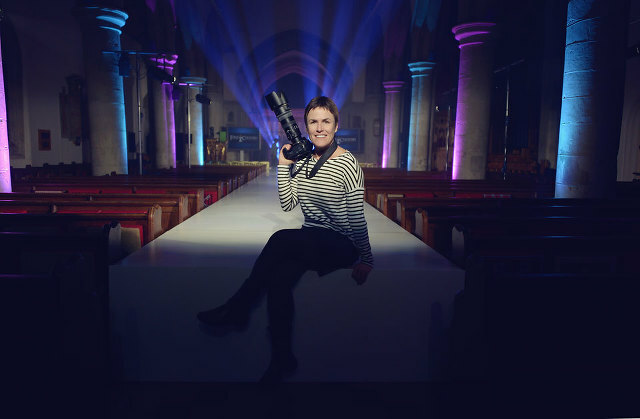 OK… this is not about boudoir photography but really wanted to share this as I am so proud to have been the official photographer for a big chairty fashion show organised by Fine and Country at the beautiful St Peters Church on 23rd November. What I really loved about this event was the fact they used local women (and men! ), not professional models on the catwalk. Women like us from teens to 70s and ALL different shapes and sizes. I watched them transform during the rehearsals… looking a little nervous and unsure at first to eventually with practise and encouragement, thumbs up and smiles from us you could see an inner confidence develop as they began to strut down the catwalk with pride. And once they had professional hair and make up… wow there was no stopping them! That confidence shone out on the outside too. It was beautiful to see that transformation. That’s why I love my job as I see that happen in my photo studio all the time! I shot so many photos that there were too many to include in this video slideshow, so here are the highlights. Such an atmospheric venue, especially with gorgeous lighting and sound by Steve of Chilfest. The fashion show raised £7500 for The Hospice of St Francis, Berkhamsted. An amazing achievement for our little town! Local brands and boutiques in the show: Cecily Day Spa, Castle Hairdressing, Amelie, Lolly and Mitch, Billy White Designs, Abbelle, William Young 1876, Purple Menswear, Hides Couture, Marc Cain, The Lace Collection, Stella & Dot, Take me with You, Brides of Berkhamsted and Berkhamsted Sports.